Your quality of life is important to us. Non-Surgical Spinal decompression is a proven and effective safe treatment to help you get out of pain and get your life back. Your first visit will start with a one on one consultation and thorough examination in Edmonton to help you qualify for the right kind of treatment. Like a shock absorber for a car, the disc is the shock absorber for the spine. When too much pressure is placed on the disc, it bulges or herniates. Herniated Disc What are my treatment options for a herniated disc? If you live in North America, and in the city of North Edmonton your options range from yoga to surgery and everything in between. Bulging discs and sciatic pain affect up to 30% of the population at one time or another. The primary cause of disc herniation is disc degeneration, or more commonly known as arthritis. Your disc acts as a shock absorber, but through years of wear and tear, the outer fibers of the disc begin to weaken, the disc itself, which acts like a sponge, dries out and eventually a protrusion forms. Up until recently, many people were unaware of what to do short of surgery and corticosteroid injections. Conventional spinal traction has been used for years by chiropractors and physiotherapists in efforts to relieve pressure on bulging discs with moderate levels of success. In 2004, several chiropractors discovered a new approach to reliving sciatic pain, spinal decompression therapy. 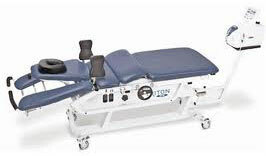 Finally there is a non-surgical option that is called spinal decompression. The main focus of spinal decompression is to relieve pressure on the bulging, degenerative disc by using an oscillating force to distract the spine and create negative pressure in the disc, drawing in the disc bulge thereby allowing the spine to heal naturally without invasive intervention. With treatment outcomes that range from 60-75% success, as compared to surgery with treatment outcomes as low as 1 in 3, spinal decompression is your best treatment option to avoid surgery. Questions? Check out our Spinal Decompression Frequently Asked Questions to learn more. Ready to make an appointment? Contact Edmonton Pain & Injury Clinic today to make an appointment.